Last night’s edition of the British institution, Eastender’s saw Dot Cotton making Jim his favorite Rhubarb & Syrup pudding. As she had no syrup left Dot searched in vain for a tin of Goldie. Of hearing that the Minute Mart had discontinued the elixir Dot rightly proclaimed “I need Syrup, Golden Syrup, it’s a staple. What’s the world coming to? 30 years ago every larder in the land had a tin of Golden Syrup. Jim’s pudding, he’s very particular, it’s got to be Golden Syrup”! 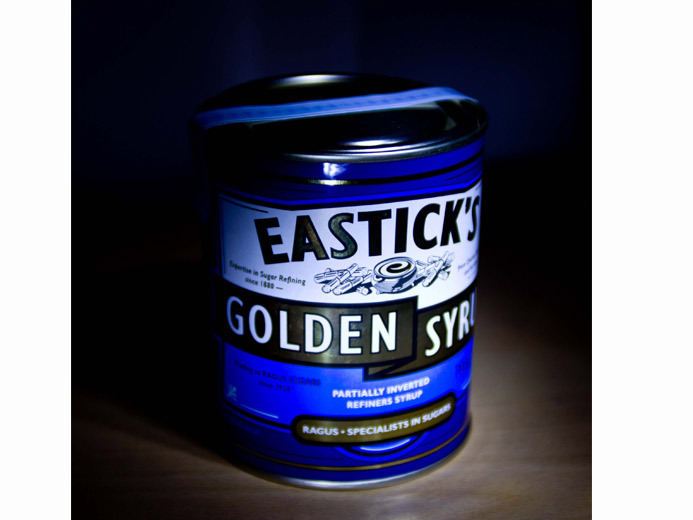 The iconic tin of Eastick’s Golden Syrup. Everyone in the office was intrigued by Dot’s pudding quest and so we searched our archives for Golden Syrup Rhubarb pudding and found this delicious recipe ! 1. Trim the rhubarb stalks, then cut them into batons and set some aside. Combine the rest with a sprinkling of caster sugar and the orange zest and juice in a pan and gently cook for 5-10 minutes until the rhubarb begins to soften. Set aside to cool. 2. Butter a 1-litre pudding basin and place the reserved rhubarb pieces in the bottom of the basin, then drizzle over the golden syrup. 3. In a bowl, beat the butter, sugar and vanilla together until creamy and light. Add the eggs one at a time mixing well after each addition. Beat in the lemon zest. 4. Sift half the flour and gently fold into the mixture. Add a little milk, then sift in the rest of the flour and fold into the mixture with the remaining milk. 5. Spoon into the pudding basin, cover with a circle of baking paper and tie securely with kitchen string. Place the basin in a large pot and pour hot water into the pot until it reaches two-thirds of the way up its sides. Cover and steam for 1½ hours. Allow the pudding to cool for about 5 minutes before turning out onto a serving plate.